I received this clip from Marcus Nispel's Conan the Barbarian last week but due to my overzealous Spam filter I only got around to watching it about 10 mins ago. Yowsers! This is our first look at the young Cimmerian Conan and clearly shows even at a young age Conan was an over achiever. The clip starts off positioning Conan played by Leo Howard as possibly a little too young to join in with older kids on a training exercise overseen by Corin (Ron Perlman) Conan's father - the prize for the winner being the chance to fight with the warriors, but when another tribe, which look to be of Pict origin, attack the training party - things take an unexpected and bloody turn. My eagerness to see Jason Momoa swing the sword of Conan just went up seven fold. 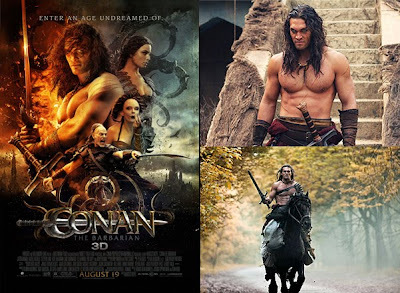 I think there is a good chance Conan the Barbarian might actually live up to my expectations that it is going to rock.